Saturday night we had a former television client of mine and his wife over for dinner. We had asked our friends the Brenda and Clay Cockerell over previously, loving both the couple, and their incredible Napa Valley Coquerel Sauvignon Blancs. To finish out the table we invited my former clients business partner and his lovely wife. A perfect table of 8 – not too large that you lose conversations, not to small that conversation topics became dull. Quite the contrary with this group, especially when you add in two perfectly chilled Mumm Napa Rose sparklers to start, followed by much more in the evening. Serving both of these with the Rose bubbly both married and contrasted perfectly. I usually go for a Rose Champagne or Sparkling Wine. I like the earthy flavors and delicate distinction that Roses often have, especially when paired with truffle and mushroom. Our peppadew dish is bright, fresh and slightly acidic, so paired with a subtle, earthy sparkler filled with strawberry softens out the acidity and enhances the creaminess of the cheese and rounds out the complete flavor. Paired with the mushroom and brie allows for a perfect combination that any Frenchman or woman would be proud to call their own. My sweetheart calls this dish a big bowl of sinful, cheesy goodness; pairing with a delicate, earthy wine creates a complete flavor profile. And one of our favorites. Once all our guests arrived and we finished our bubbly we sat for dinner. The Petit Coquerel is the younger of the two Sauvignon Blanc wines the Cockerell’s and their fantastic wine maker, Christine Barbe, create. The Terrior Coquerel is a 8 month barrel aged in French Oak, creating a rich, creamy, yet still clean and fruit forward, Bordeaux style Sauv Blanc. 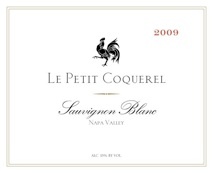 The Petit Coquerel is stainless steel aged, which creates a much lighter wine, with balanced acids and flavors of minerals, lemon, melon and apple which begs to be served chilled with bright, clean flavors or drunk on its own. With the watermelon heavy first course the wine balanced both the spice in the soup and cut through the creamy feta in the salad while pairing seamlessly with its herbal, anise flavors. For dinner we had pulled three bottles of one of our favorites – Chateau Montelena 2005 Cabernet Sauvignon. We love Chateau Montelena, and not only because Bottle Shock brought our two worlds together (wine and film) and The Judgement of Paris was one of the greatest steps Californians made to show world class wine can come from California; but our love comes from it being just really great wine! Chateau Montelena Cab is everything that is distinct and special about Napa Valley Cabernet. Bright cherry and deep plum, followed by hints of dried cherry and figs with nutty cedar and chocolate. The wine is elegant, with velvety tannins and a lingering finish that always requires another bottle to be enjoyed…. With a big wine we went for a big meal – tenderloin with truffle mac and cheese. In case my earlier account of truffle didn’t convince you, this may. I love truffles. My sweetheart marinated a perfectly lean 2 pound beef tenderloin for about 2 hours in generous amounts of rosemary from our garden, garlic, coarse ground sea salt and pepper, minced together almost into a paste and rubbed on. Wrap in plastic wrap and refrigerate until about an hour before you want to cook it. Never cook cold meat. Always let the meat come back up to room temp, may take an hour, and then cook it on 400 degrees for about 40 minutes. This will create a perfectly rare (120 degree internal heat) piece of meat which, if you allow to rest for 45 minutes to an hour will continue to cook slightly to about 150 degrees/the desired medium rare temperature. I am usually not a big beef eater, trying to stay on the lighter/healthier side of things. I was pulled in with this perfect preparation though. The extreme ease we had cutting the meat for each portion, matched with the bright reddish pink hue of the meat begged to be enjoyed. Fork tender. And sublime with the meaty red wine. And paired with my truffle mac and cheese – not my usual healthy m.o., but sometimes you just deserve a decadent indulgence. And this definitely falls in to this category. The Cockerells brought a bottle of their Le Douce Revanche with them…their “sweet revenge” late harvest Sauvignon Blanc that is a light and elegant dessert wine. Not too sweet, or too syrupy as some dessert wines are. Filled with clean lemon peel, oranges and crisp apple with a lovely, nutty finish. We paired this with a simple apple tart that is so easy that anyone can make it. Amazing with the dessert wine. I usually rinse the peppers gently before I start working with them. Don’t break the side though, keep them intact so the mixture stays inside. Stuff each pepper with a bit of pesto, a bit of goat cheese and half of one basil leave. Chill well and serve. Could substitute feta cheese for a less pungent flavor. One small whole wheel of good Brie or Triple Cream Cheese (Like St Andres) – the richer the cheese the better the dish. Preheat your oven to about 375 degrees. In a large pan heat the oil and add the shallot and garlic to sauté. When slightly golden add in the mushrooms and thyme. Just coat with the oil and then add in the wine. Add salt and pepper to taste. Sauté until almost all the wine has evaporated out. Add in the parsley and wilt while the rest of the wine evaporates out. The mixture should be moist, but not watery. Remove from heat and cool slightly. With a very sharp or serrated knife skim the top layer of the brie shell off. Place the brie in to an oven safe dish. I use a large white ramekin that the brie wheel fits snuggly in to. If you have the truffle paste add a layer to your taste preference. Truffle paste can be strong, so you may what to test this dish with just a thin layer. I LOVE truffles, so the more the better in my opinion, but a little does go a long way in the world of truffles. Remove foil and if you did not have the truffle paste, but have truffle oil, generously drizzle on top of the mushroom mixture allowing the oil to cover the dish. Serve with the fresh, sliced baguette. In a food processor pulse all the watermelon to a fine pulp. Set aside. On Medium heat and in a large non-stick pan add the oil, garlic, ginger, red pepper flake and jalapeno. Sauté until the garlic and ginger are golden. Add in the wine, tomato paste, sugar, and cinnamon. Continue sautéing for about 3 minutes. Add in the watermelon puree and all the herbs, and season with salt and pepper to taste. Cook for about 10 minutes until the flavors combine. Re-season with salt and pepper, and any additional sugar if the soup is too spicy or flavors need adjusting. Soup can be strained if you want it watery thin. I like the chunky pulp. Immediately store in a refrigerator for several hours, or if you are serving within an hour or two put in the freezer so the soup can get super cold. Serve in chilled demi-glace cups with ½ teaspoon of pesto along with the watermelon/tomato salad. If you have leftovers they are excellent the next day. In a food processor pulse all ingredients until well combined. Slowly drizzle in olive oil until the pesto has emulsified and all ingredients are blended, but there is still good texture. Refrigerate the pesto until ready to serve. Can be refrigerated for several days. Salt and Pepper – I like to use pink Himalayan salt and white pepper on this dish, but regular black pepper and sea salt are just fine. For the dressing –Whisk the chopped mint, fennel frawns, tarragon, lemon zest and juice, garlic, shallot, Dijon and vinegar together. Drizzle in the olive oil as you whisk to emulsify. Season with salt and pepper to taste. For the salad -You can either serve this with the soup in the center of a large round plate, or to the side of a square plate. If serving on a square plate layer one of red tomato with 1 slice of yellow tomato on each plate. Add about 5-6 cubes watermelon, 3 cut grape tomatoes, 4 cubes feta and a sprinkle of fennel. Season with salt and pepper. Drizzle a small amount of dressing on each plate, reserve a bit for the greens. Take the remaining vinaigrette and lightly dress the mustard greens. Distribute the greens evenly among each salad plate and decorate with the remaining mint and fennel frawns. Serve with the watermelon soup. Panko breadcrumbs – if you can’t find Panko Italian style breadcrumbs will work. Set a large pasta pot filled with salted water on to boil. Preheat oven to 375 degrees. In a large pan melt the ½ stick butter and flour together to make a rue. Whisk continuously until the mixture has come together into a brownish paste. Continue whisking while adding in the milk. I have added in both warm milk and cold milk, either has worked just fine for me, so cold is fine and easier. Continue whisking until the sauce gently thickens. Add in the nutmeg, garlic, thyme, ½ of the parsley, 1 teaspoon of salt and pepper each and continue whisking. The pasta water should be boiling by now so add about 2 tablespoons olive oil and drop the pasta. The oil will just help keep it from sticking to each other. Boil for about 10 minutes until just al dente (not quite fully cooked). Begin slowly adding in the cheese to the sauce, little by little until all begins to melt together in to a creamy rich sauce (reserve the additional 2 oz parm cheese.) Once blended add in the truffle paste or the mushrooms and the mushroom water. If you use the mushrooms you may need to cook the sauce a bit longer to evaporate some of the water, continue whisking so the sauce won’t break. Blend well and season with additional salt and pepper to your taste. In a separate dish melt the remaining 2 tablespoons butter and blend with ½ cup Panko breadcrumbs, the remaining parmesan cheese and parsley. Mix well. Spray either an oven safe dish or individual ramekins with non-stick spray and load in the mac and cheese mixture. Top with the Panko mixture and a touch of olive oil and bake for 20 minutes or until the tops are golden brown. Serve bubbly and hot with an extra touch of truffle oil if you like. I used puff pastry, put you can just as easily use a store bought pie crust (that you roll out yourself) or make your dough. I like the puff pastry though, adds another layer of texture to the dish. Roll the puff pastry out to a 10 x 12 square and lay on a baking dish. (I put some parchment paper down underneath to prevent the pastry from sticking. ) Slowly start laying the apples down the pastry working from the top to the bottom, slightly overlapping but not directly on top of each other. Leave about a 1 ½ inch border around the pastry to allow for the edges to puff. Once all the apples are laid and the pastry is covered, dot pieces of the butter all over the pastry. Sprinkle lightly with the salt to cover the pastry. Sprinkle with the ½ cup sugar to cover. Sprinkle the tyhme over the whole dish. (I like to use a bit of a savory element in desserts, and herbs are perfect for this. It adds just a slight hint of spice without overpowering.) Mix the cinnamon with the 2 remaining tablespoons sugar and sprinkle over. Sprinkle over the orange zest to cover. Bake for about 15-20 minutes, checking to see when the apples are slightly golden and the pastry has puffed golden brown. In a small saucepan, combine the marmalade and liquor and bring to a quick boil, then cool to melt the marmalade into the liquor. Brush the cooked pastry with the liquor mixture to give the pastry a glossy sheen. Serve hot or room temp.